Do students with disabilities get the help they need? 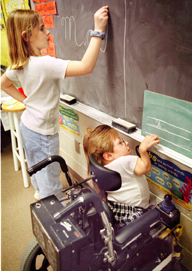 The Education for All Handicapped Children Act was passed in 1975 after the courts ruledthat states must provide a “free appropriate public education” to children with physical, mental or emotional problems. Under the law, renamed the Individuals with Disabilities Education Act (IDEA), the federal government is required to help local school boards pay for the special-education services needed by students with disabilities. Although the law has produced many successes in integrating the nation's 6 million disabled children into public schools, troubling problems remain. The dropout rate for disabled students is far higher than for non-disabled students. And countless disabled children, especially from low-income, minority or rural communities, are not receiving the full benefits of the law.